﻿Texas Free Trappers re-create state’s forgotten fur trade. ﻿Grey Wolf stalked his prey, feeling every twig and acorn through the thin soles of his moccasins. Sunlight darting below the thick canopy of the woods glinted off the well-worn antler handle of the knife sheathed on the leather strap across his coarse, pale-blue linen shirt. Below it dangled a powder horn and a “possibles” bag, a handmade leather pouch containing lead balls, patches and a variety of items needed for hunting — or self-defense. Grey Wolf spied something in the shadows of thick brush and tugged his leather-brimmed cap down tighter. His scruffy white beard bristled across the stock as he shouldered the long rifle, leaned below a limb, cocked the hammer and squeezed the trigger. Acrid blue-white smoke erupted from the muzzle. A loud clang rang out. Forty yards away, a small metal target swung in submission. “My favorite thing to do is the trail walk. It’s a lot more like real life, when you’re hunting or being hunted, than paper targets,” says Grey Wolf, the name retired architect Joe Wolf goes by when he relives the colorful era of the mountain men of 1825–38 through the organization he founded six years ago, the Texas Free Trappers. For a weekend in November and February, some 30 members from across South Texas leave today behind, head to a ranch on the banks of Cibolo Creek near La Vernia, wear period clothes, set up historically accurate camps, cook and eat with bygone utensils and live life as it once was — right down to hog-bristle toothbrushes. Vehicles are parked out of sight. There may be a flashlight or cooler around, but they are stowed in canvas replica tents. While setting up camp on a Friday morning, Wolf saw 19-year-old Travis Vickers in a T-shirt and blue jeans. “Where’s your period dress?” Wolf shouted. “I don’t wear a period dress — I wear period pants,” Vickers retorted. Soon, he was back in white cotton breeches and a tan sleeveless shirt with a flap front. The Texas Free Trappers is one of about two dozen such organizations across the state, including a sister club, the Fritztown Free Trappers, which meets near Fredericksburg. Like other members of those groups, Wolf is hooked on his­tory, especially the era of beaver trade that supplied felt for hats of the fashionable in New York and Paris while blazing trails that led to the United States’ expansion to the Pacific Coast. Mountain men were adventurers and fiercely independent. Many were avoiding debt, family problems or prison. “You could get $6 a pound for beaver pelts. Trappers were making a lot of money, and it was worth risking your life,” Wolf says. The mountain men held gatherings, or rendezvous, as a way to sell furs, resupply, see who survived the hardships, drink cheap whiskey and compete in foot races, wrestling matches, shooting competitions and knife- and tomahawk-throwing contests. “It was just a wild, two-week-long party,” Wolf says. 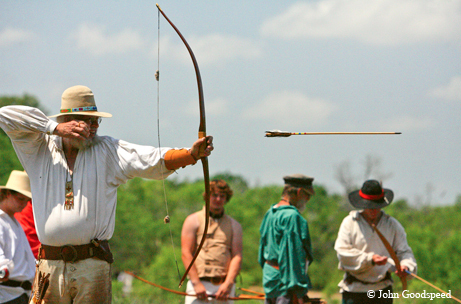 The Texas Free Trappers re-create those competitions with trail walks for rifle, pistol, knife and tomahawk. Like the mountain men, members make many of their own items, from knives and necklaces to shirts, pants and moccasins. They trade for things they cannot create, such as pots and pans from blacksmith Glenn “Iron Burner” Darilek. “It gives me great pleasure to bring the study of history to life, to live it, breathe it and taste it, even though this is much milder than the original rendezvous,” Wolf says. While the term “mountain man” conjures images of the Rocky Mountains, these adventurers spread across the land west of the Mississippi, including Texas. Little is known about the state’s fur trade, but free trapper member John Potter hopes to shed light on it with a book he is writing. His research shows that French trappers crossed the Sabine River in 1730, and the Spanish tried to stop their illegal commerce. After the Mexican Revolution, the problem continued, compounded by the influx of Americans. A Mexican government trading post in what now is Burleson County in 1828 slowed the flow. Still, in 1834, a Mexican colonel reported that some 150,000 pelts of beaver, otter, white-tailed deer and mountain lion were going to the United States. Texas, though, never had a rendezvous. That does not matter to Bruce “Blind Hog” Shulter, who laid his flintlock rifle across handmade leather pants while cleaning it after the trail walk. The rendezvous was the first for Jim Haynie, who, like Shulter, is a longtime aficionado of muzzleloading firearms. 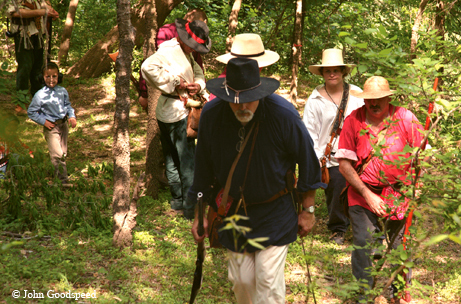 Haynie is a member of the White Smoke Brigade, another sister organization of the free trappers that conducts monthly black-powder shoots near New Braunfels without requiring period attire. Haynie also likes the fact that members are welcome even if their accoutrements are not complete. He wore walking shoes but has ordered a moccasin kit. He slept in a travel trailer hidden with the other vehicles. But he plans to make the remainder of his gear, including a tent, before the next rendezvous. “A muzzleloader is not cheap, but you can put everything together for around $1,000,” he says. Rendezvous are a continual learning experience for 23-year-old Taylor Tomlin, who began at age 9 in New Mexico with his grandparents. Tomlin, a consultant on costuming and historical authenti­city for films and documentaries, attends other rendezvous across the country and, like some other members, participates in re-enactments of Texas battles, such as the ones this year that marked the 175th anniversary of independence from Mexico. That was the goal for Gerry and Cathy Messmer. “I want my kids to learn these skills that we need to preserve. They enjoy the freedom of knowing they can survive without modern efficiencies,” Gerry Messmer says. Gerry IV, 20, Jason, 18, and Lucy, 14, attended re-enactments of the Amer­ican Revolution along the East Coast with their father until the Army lieutenant colonel, a veteran of Iraq and Afghanistan, was stationed at Fort Sam Houston. The family fit right in at their first rendezvous with most of their clothing and equipment already made by Gerry and Cathy and their study of Texas history well under way. As the sun set on a long Saturday, the Messmers and others prepared a massive potluck dinner. The main dish, pork stew, simmered in a Dutch oven under the watchful eye of camp cook John “Char Cloth” Clark, who earned his nickname — the term for charred fabric used to start a fire with flint and steel — after accidentally setting his shirt ablaze. After dinner, the group settled around the fire to trade items and make up stories about them, some based in history, such as the bullet that mountain man Jedediah Smith bit into when an arrow was removed from his chest, and others based in myth, like panther eyes that see into the future. 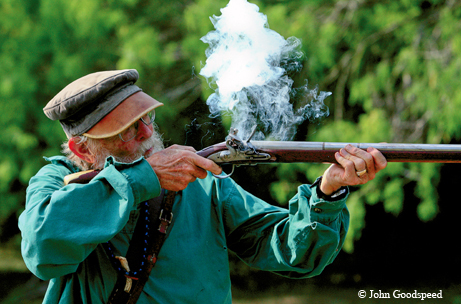 Members of the Texas Free Trappers, though, have no need for objects to conjure the past. They live it twice a year.